Thankfully, Spielberg’s The BFG stays faithful to the treasured Roald Dahl young adult novel with old-fashioned storytelling of the love between a wise older giant and an eight-year-old English girl. Set against the backdrop of a magical land outside of London, the story focuses on a giant who is both kind and friendly. Spielberg’s quoted as saying, “This is a story of the love between grandparents and their grandchildren.” It’s paced slowly, similar to a dream-like fantasy, an appreciated slowness for sure. And, fortunately, you’ll find no racing action scenes that are typical of children’s film these days; ones in which characters are whizzing by in cars, trains, or those monotonous sledding scenes as in the Ice Age movies. The story is told through the eyes of a precocious child, “Sophie,” played by newcomer Ruby Barnhill, who is befriended by the BFG (Big Friendly Giant), Mark Rylance (Bridge of Spies 2015). They have grandiose adventures together and ultimately devise a plan, one of which involves asking the Queen of England to rid the land of all the child-eating giants. Picturesque landscapes filled with awe-striking magic are shown as the BFG shares his dream-catching world with Sophie. Their sweet, innocent friendship warms our hearts. You can’t help but be moved by the film, especially if you are a parent, or even more profoundly moved if you’re a grandparent like me. When I taught gifted nine- and ten-year-olds, this book was always a classroom favorite. The reasons why are simple: Dahl writes with layered messages, creating young characters that are strong minded. They have enriched vocabularies and, of course, there’s always a sense of danger followed by a rollicking adventure. Dahl dedicated The BFG to his daughter Olivia, who passed away at a young age, however, the main character, Sophie, is named after his granddaughter. Considering that it’s one of his most personal novels, we are the benefactors, as the film is rich in depth, which helps create that wonderful lingering feeling long after the credits have rolled. Yes, this is a film that stays with you. When The BFG opens, we hear and see Big Ben chiming at 3:00 a.m., while Sophie wanders around the orphanage in the dark. Her spunkiness is shown immediately as she yells to a group of drunks on the street below, telling them in no uncertain terms to “hush.” Before we know it, she’s snatched by the BFG, who’s also wandering about—although his meandering is through the streets of London as he listens (with those oversized ears) to children’s dreams. He carries her through the night sky off to the land of giants; his ultra cool giant home mesmerizes Sophie. The attention to set design is spectacular; so many details give us clues as to the reasons why the BFG cares so much about children and their dreams. Sophie is immediately enthralled by her situation and begs the BFG to teach her how to catch dreams and how to give dreams. We are also introduced to the nine giants that live in the valley. Bullies for sure, they aren’t very smart, and give the BFG a hard time by barging into his house while demanding he surrenders the “human bean” they’ve been sniffing. A note to parents: these giants can be very scary; they are of course big, loud, and frighteningly ugly. Their intentions are clear—to eat Sophie. And we know they will because they ate another child who used to live with the BFG, a boy. Sophie tells the BFG she has a plan. They must go the Queen of England and tell her their plight. The Queen will surely want to save the children of London from scary giants. 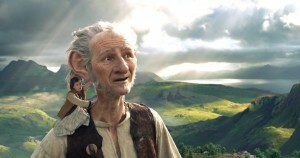 This is where the tables are turned and the BFG needs to find his bravery. We see plenty of humor when Sophie and the BFG ultimately visit the Queen. Staying true to the eighties time frame, The Queen (Penelope Wilton), upon realizing that the giants must be stopped (through a dream, of course), is shown placing a phone call and we hear her say, “Nancy (Reagan), is Ronnie there?” Then she demands, “Well, wake him up!” What happens next are some of the most humorous scenes in the film. You can’t truly write about The BFG without mentioning the ridiculous vocabulary the BFG uses, which at times can be exhausting to follow and somewhat annoying, although one should note that “Gobblefunk” language has a huge following with readers. You can even preorder a copy of the new Oxford Roald Dahl Dictionary at the Barnes and Noble website. Dahl created this unique language for his novels: words such as delumptious, swizzfiggling, and whizzpopper. Endearing, entertaining, and beautiful all describe the experience of viewing The BFG on the big screen. I’d say it is a wonderful film for all, except those perhaps under the age of eight years old. The Bottom-Line? : Fans of the Roald Dahl’s novel The BFG shouldn’t be disappointed in the adaptation. Cast: Ruby Barnhill (Sophie), Mark Rylance (The BFG), Penelope Wilton (The Queen of England).